As we are in the throes of what is perhaps cricket’s most hallowed and revered series, the trans-Tasman T20 tri-series, it seems apt to take this opportunity to think deeply about the T20 game in a historical context. Or, to put it another way, I like making lists and I thought of a cool one. T20 is such a modern innovation that it’s intriguing to consider what the legends of yesteryear might have done if they’d had the chance to compete in this most violently abbreviated of international cricket formats. I have therefore come up with this, the out of time XI: a team of past greats who would’ve been huge successes in T20. Together, these 11 shadows of history would form a franchise to be feared in any league. One rule I made was that all members must be players whose careers took place entirely or mostly before 1971, when limited-overs internationals began. This is partly because the older they are, the more fun they are to speculate about, but also because I didn’t want the team to be filled with ODI champions whose feats I merely miniaturised. I wanted to force myself to be a bit more imaginative, so the hard and fast rule was put in place: nobody whose career occurred mainly in the limited-overs era. I mean… Duh. You’d be a fool to leave out the greatest batsman in history, particularly given that all contemporary accounts stress just how good he was at picking gaps with fiendish precision. The Don’s ability to strike the same delivery to five or six different parts of the ground, or to crack a boundary through one gap, and then another through the gap opened up by the fielder moving to plug the first gap, is legendary. Basically, he did what he liked. Some may quibble over the fact that his famous paucity of career sixes is not compatible with the 20-over game. 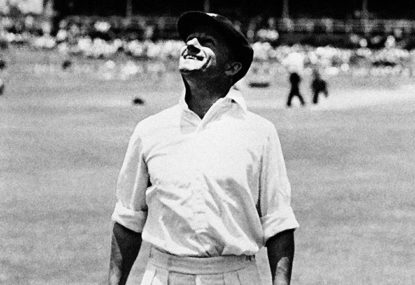 But Bradman didn’t eschew sixes because he lacked the ability to clear the rope – rather, he saw no need, in the extended first-class game, to give a sucker an even break by lifting the ball off the carpet. When he believed a maximum would suit the circumstance, he sent the ball skimming into the crowd as well, or better, than anyone, with a power Bill O’Reilly, for one, couldn’t fathom dwelling within his diminutive frame. See, for example, his knock for the Blackheath XI in the Blue Mountains in November 1931. Over his first 22 balls, his scoring shots were 6 6 4 2 4 4 6 1 6 4 4 6 6 4 6 4 6 6 1 4 4 6. A century reached in 22 balls and 18 minutes, including the time taken for locals to retrieve the ball from up trees and across roads. Ten sixes were included in that first hundred. He finished with 256 with 14 sixes and 29 fours. We can be fairly sure that Bradman would make a mess of any T20 attack, and that any team with him at the top of the order would specialise in immense scores. The golden age of cricket was filled with suave men striding fearlessly down the pitch to send elegant drives scorching to the fence, and in one way Gilbert ‘The Croucher’ Jessop was the epitome of the era’s focus on pleasing aesthetics and bold, attacking cricket. In another way he was an anomaly in his era, as he would’ve been in almost any era, such was the startling ferocity of his strokeplay. He hit fearfully brutal shots all around the wicket with absolutely no regard for convention or defence. 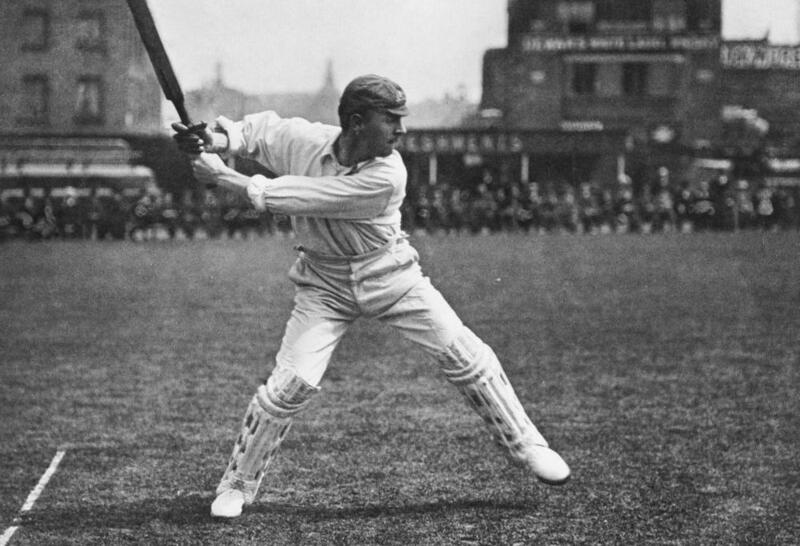 He once hit 286 in three hours for Gloucestershire, and in the Oval Test of 1902, defeated Australia almost single-handed when he came in at 5-48 and smashed 104 out of 139 in 75 minutes. A T20 specialist when the idea of the game was not dreamt of, Jessop also happened to be a Test-standard fast bowler, and a lightning-quick fielder with a bullet throw. If Trumper’s assaults on bowlers were slightly less savage than his golden age contemporary Jessop, he stood alone for sheer skill. Capable of taking apart any attack with every shot in the book, or driving bowlers to distraction with numerous shots that weren’t in any book, he could glance, leg cut and play the old-fashioned between-the-legs draw shot just as well as he could flay cover drives and massive straight hits. Relentlessly attacking in the way every T20 batsman should be, he was also the undisputed master of difficult wickets, making him the man for all seasons all teams are desperate for. The only man in the XI who did experience limited-over cricket at the highest level, Sobers nonetheless created his legend in the longer game, and played the same no matter what format he was in anyway. From the late 1950s to the early ’70s, Sobers bestrode cricket like nobody apart from Bradman, and was an all-rounder of such unfeasible talent that even the Don is occasionally placed second in good judges’ lists of greatest of all time. As a batsman he was near-peerless, routinely dismantling the world’s best bowlers with a method based less on the textbook than on the insatiable urge to hit the ball as hard, as far and as often as possible. As a bowler he carried the West Indies’ attack almost as often as he did their top order, and was moreover capable of taking wickets with fast-medium swing, left-arm orthodox or wrist spin (like Steve Smith, he was first picked for Tests as a spin bowler). This makes him the ideal man to have around in a T20, able to switch bowling style depending on conditions and opposition weaknesses. He was also an acrobatic fielder, because of course he was. The thought of how much he would fetch in an IPL auction is almost frightening. The West Indies’ first great all-rounder was way ahead of his time – in a stronger team, his outlandish talents perhaps would’ve been given greater room to shine; in a later era he would have lit up stadiums everywhere he went. He bowled with exhilarating speed and the willingness to get the batsman hopping that his successors in Windies teams would make a trademark. As a batsman, he hit hard and with shots that baffled onlookers with their audacious improvisation. His legend was cemented in the game against Middlesex in the West Indies’ tour of 1928, when he cracked 86 in the first innings, took 7-57, and then thrashed 103 out of 133 in one hour. One of his drives ended Jack Hearne’s season with a broken finger. On top of that, the future Baron Constantine was acknowledged as the greatest fielder in the world, a freak of nature in every position. Like Sobers and Smith, Macartney entered his national side as a bowler, giving service to Australia as a left-arm spinner before the First World War. By the time Test cricket was suspended for that conflict, it was clear he was a classy all-rounder, and when it resumed in the 1920s he showed his prowess as a brilliantly thunderous batsman. He hammered the English through that decade even as, like many of the brightest stars of T20 leagues, he pushed towards and beyond the age of 40. On the 1921 Ashes tour he murdered the Nottinghamshire bowling to the tune of 345 in less than four hours – the highest first-class score attained in a single day. Once he reached a century before lunch, called for a new bat and declared, “Now I’m going to have a hit”. His approach was typified by his advice to aspiring batsmen to hit the first ball straight back at the bowler – “it rattles ’em”. The pre-Adam Gilchrist era yielded little in the way of free-swinging, big-belting keeper-batsmen, but there were plenty of cheeky scrappers who made it their business to frustrate bowlers by merrily squeezing and squirting the ball wherever the fielders weren’t, just when the opposition thought the breach in the wall had been opened. England’s gloved sprite of the ’40s and ’50s, Thomas Godfrey Evans was king of this breed. In a T20 game he would not be the man to come in and clonk six after six over the grandstand, but if the team was floundering he’d be just the fellow to dance down the pitch, leap about the crease, and invent whatever shots were necessary to pull the side out of the mire. Plus, as a keeper there may never have been a better – his dexterity behind the stumps, to spin or pace, took the breath away. He made wicketkeeping a spectacle in itself. A prickly character who battled tragedy and inner demons throughout his life, Lockwood was also a bowler of sublime skill and subtlety, and a batsman good enough to rank as an all-rounder. He won many games for Surrey and England through the 1890s and early 1900s, through mastery of spin, cut and variations of pace. He had that mysterious ability of some bowlers to appear to gain pace off the pitch, and was noted for his wicked break-back, pitching outside off and smacking into the batsman’s thigh. For the purposes of a T20 team, perhaps his most valued talent was the ability, more than a hundred years before Andrew Tye, to baffle the world’s best batsmen with an almost undetectable slower ball. The science of bowling was still in its infancy, but Lockwood’s slow one was described as being “of almost sinful deceit”, and there’s no doubt Lockwood would have been a nightmare to face when the adrenalin is pumping and the required rate is climbing. Every T20 side needs a bowler who can simply steam in and deliver four overs of blinding pace. Not that this side isn’t blessed with speed already, with Jessop and Constantine, but Typhoon Tyson was the ideal new-ball bowler for the format, sadly cursed to play in the ’50s. The intellectual and urbane Tyson was a holy terror on the field, for a few short years. He burnt out before he faded away, but had he had the opportunity to forge a career bowling just four overs each match, encouraged to let rip without restraint or need to conserve energy for later in the day. It’s likely the raw speed that shocked the bejeesus out of a star-studded Australian batting line-up in 1954-55 would end its share of opposition innings before they began. The first East Indian to play for the West Indies reduced brilliant batsmen of various nations – but England in particular – to gibbering wrecks. Notionally described as an offspinner, Ramadhin actually bowled both offbreaks and legbreaks, and opponents were damned if they could tell which he was going to send down by his action. Long before the doosra came into fashion, Ramadhin was sowing confusion and doubt with indecipherable mystery spin. His effect on hard-charging T20 bats who struggle even with more prosaic forms of slow bowling would be devastating. 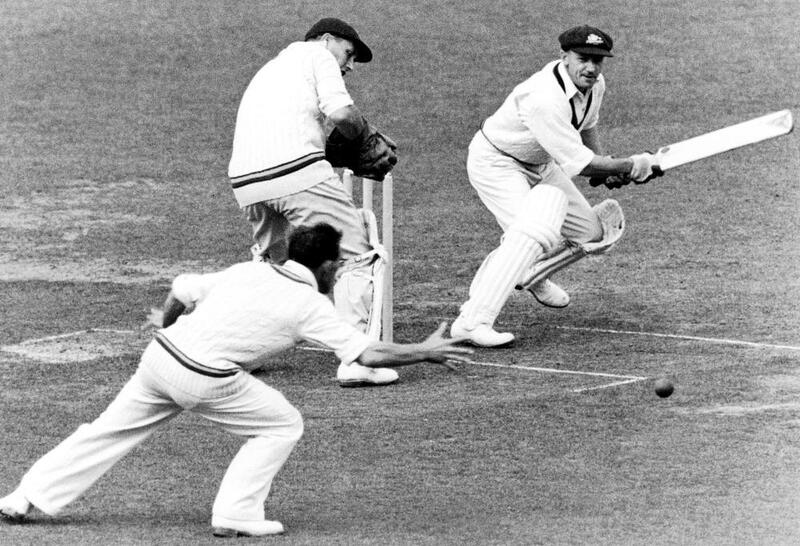 A man of boisterous spirit and film-star looks, who practised the least glamorous of all cricketing arts – slow-medium bowling – Ernie Toshack played in the shadow of Australia’s fearsome post-war pace attack of Ray Lindwall, Kieth Miller and Bill Johnston, but was a vital cog in the machine. Relentless accuracy, subtle movement and canny changes of pace were his tools of trade. On a sticky wicket he was unplayable, but even on a road he was devilish hard to get away, and for a team looking to lift the tempo, the sight of Toshack trundling in would be as menacing as any pace tearaway. There’s a team for you. Scintillating batsmanship, massive hitting power, adaptability, improvisational skill; and with the ball speed, spin, skill, variation and accuracy. The BBL would surely be at their mercy.